It’s never too early to start building credit. If your child is in college, now is the perfect time. Your child can land a dream job, have saved several thousand dollars, but still be unable to obtain a loan for a car or a house without a solid credit history. There are many ways to help your child build credit. A few options cost a little money, at least in the short-term. Other options are free, but carry more risk. Regardless of your situation, there are things you can do to help your child. 1. Get your child a secured credit card. A secured credit card appears to be just like any other credit card with one key difference: A deposit has been paid to open the account. The available credit limit is no more than the amount of the deposit. • While normal payments still have to be made, the bank offering the card is 100% covered. If your child fails to make the payment, the money is taken from the deposit. • In time, many banks will allow a secured credit card to be converted to a conventional credit card. • The deposit is returned when the card is cancelled. Keep in mind that these cards are often loaded with fees, making them expensive to use. 2. Cosign a loan. Allow your child to take out a small loan with your support. The amount doesn’t have to be large, even few hundred dollars is enough to start building a solid credit history. Just ensure that the loan is getting paid. It’s not a bad idea to keep the proceeds from the loan in your own account and make the payments yourself. 3. Use a secured loan. 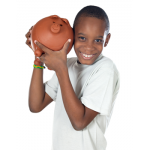 Your child can use a savings account as collateral for a loan. Banks love this type of loan because they’re 100% covered whether the borrower makes the payments or not. The funds in the savings account are released as the loan is paid off. • These loans are easy to acquire and work as well as any other means of building your child’s credit. 4. Add your child as an authorized user on your credit card account. This is easy to do, too. A quick call to the issuing company is all you need to do. Your child will receive their own card with their name on it. Any charges they make will appear on your bill. This is good news, since you’ll be aware of their spending habits. • Remember that it’s still your account and your responsibility. If your college student flies off to Cabo for a wild weekend, you’re still as legally as responsible as your child for the bill. 5. Co-sign a credit card. Your child will have their own card, and you won’t receive the bills. How much do you trust your kid? Be careful. • As a co-signer, any failure on the part of your child will affect you, too. You can be held responsible for the bill, and your credit rating can be harmed, too. This is the riskiest option for a parent. It’s important to build a credit history before you need it. If you’ve ever had poor credit, you know how challenging it can be. It can limit your options. It’s natural to want to give your child a solid financial start by beginning the process of establishing credit before they complete high school. Investigate all of the available options and put a plan in place.